I have always thought this song nailed it – I will never understand people. I know well how easily hurt we can be, so why hurt anyone else? How is it helpful to yourself to inflict pain on another? Could we all just be ever so slightly nicer to each other than necessary? A little kinder? A tad more forgiving? A snippet less judgmental and a lot more open? I will forever choose to err on the side of a generosity of spirit. Those who cloak an attack in the dress of self-protection will always find their world ever growing smaller, meaner and lesser in every way. People who choose to move forward on their own path, leaving pain and bitterness behind to wither, will move ever lighter and more freely. I found another one! I can’t stay online any longer as the heavens have more than opened and the storm is now adding lightning strikes coming too close for me to risk a power surge, but LOOK! 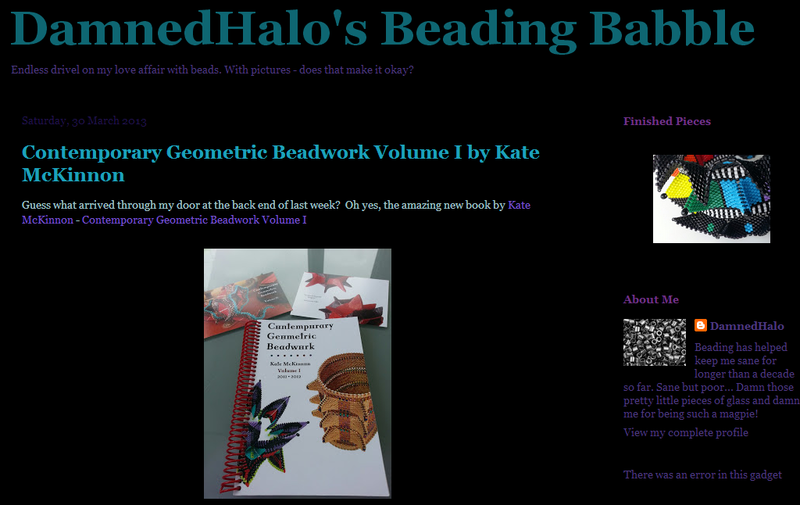 Damned Halo has reviewed Contemporary Geometric Beadwork, too! This is so much fun – I hope I can find more tomorrow! Again, a-surfin’ I have been and LOOK! 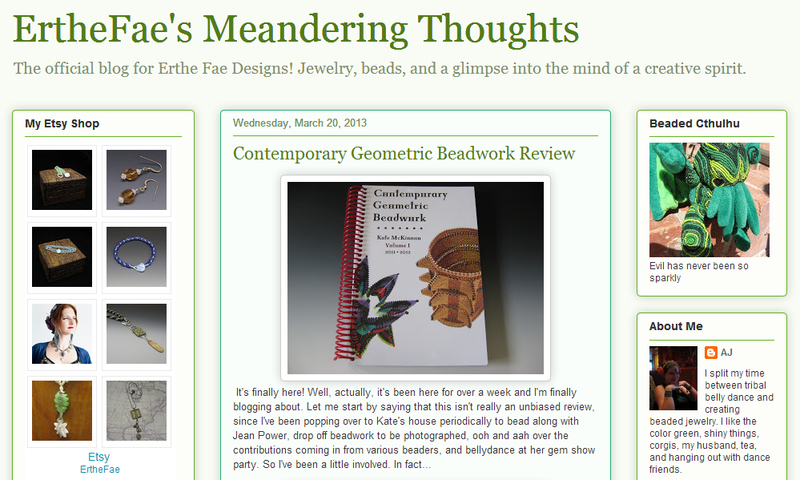 I found a blogger who reviewed Contemporary Geometric Beadwork! Pop over to ErtheFae’s Meandering Thoughts to see what she thinks of our lovely, shiny new book. Cruising the web, going from link to link to link, just taking a break…..and pow! Look what I found! It’s my Fortuneteller, done by someone I’ve never met, and who I had NO IDEA was working on one but was gracious enough to share via her blog. Whoever you are, Beadayle, way to go! What a lovely surprise. Look what I missed! Can you believe it? Such gorgeous colour and wonderful creativity and I only just found it! I DEFINITELY need longer days; there’s no time to surf about, keeping up with everyone and treasures like this deserve to be seen! 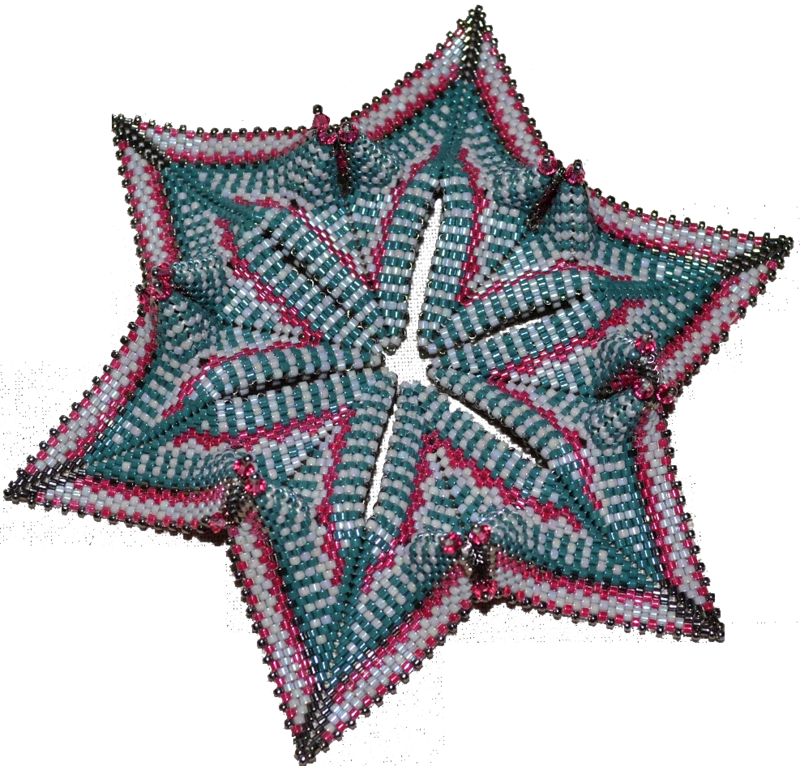 I’m sure many, if not most, of my readers are familiar with Eva Maria Keiser; her geometric beadwork and exquisite colour presentations are legend! I don’t think I’ve ever had the pleasure of meeting her yet, but I’ve been a fan for years. And Cath Thomas is a force to be reckoned with in the world of beading innovation. Oh my goodness, what a wonderful day this has been! BeadFX held a fabulous launch for Contemporary Geometric Beadwork with a gorgeous cake and munchies and coffee…such a lovely thing to do. 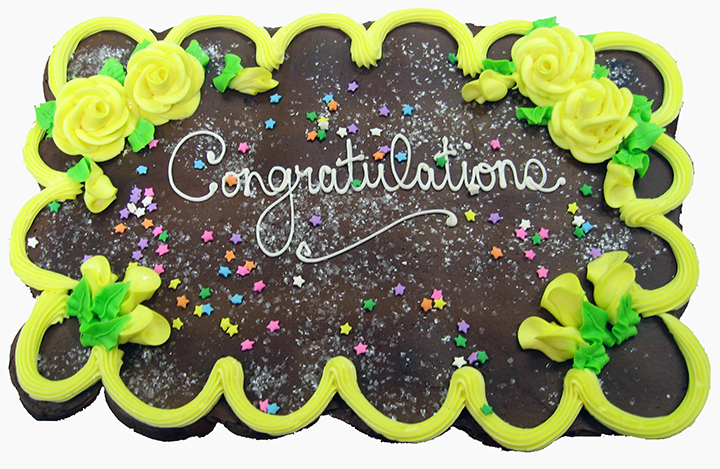 Marg, Pamela, Stephanie, Rosemarie, Rochelle, Ray – they were all so warm, welcoming and kind. It was fun to talk about the book with customers and hear what first caught their eye in the book. Much to my surprise, I already knew several people who were in my workshop, which was a delight. It’s always nice to catch up with people; especially fellow beaders! Marilyn Gardiner was there and it was a treat to have her in my class. She’s only just back from a trip so it was an honour to have her make the effort to come out to class and to pick up off-loom beadwork for the first time in ages. 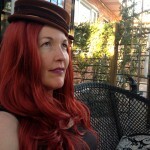 Undoubtedly you’ll know her from her chainmaille work – it’s exquisite! A fabulous day in all respects and hopefully the first of many. Mandi Ainsworth interviewed Kate McKinnon for her Podcast on April 4th. I’ve just finished listening to it and I recommend it to my readers. Mandi’s questions are to the point and Kate does a great job of revealing what Contemporary Geometric Beadwork is all about and the philosophy behind the new type of release she has created for the book. Visit Bead Circle Network and listen to their conversation; you’ll enjoy it and probably learn a bit, too. In Canada? Click on my shop link to order. In the United States? Order your book directly from Kate McKinnon. In Europe? Shop directly from DiMarca Online, based in France and the Netherlands. In the UK? Spangles will be delighted to take your order! Spangles4Beads. ...or check your local bead shop, it's probably on the shelf. If not, ask them to carry it, or order you a copy. Enter your email address to follow Spiritbead and receive notice of new posts by email. Christina Vandervlist was trained in performance, design and teaching technique from a very young age. Art has always provided a welcome outlet for her creativity as well as a way to connect with others. Christina has enjoyed teaching classes at the Bead & Button Show (the world’s largest consumer bead show) multiple times, as well as repeated engagements at Bead Fest, and innumerable times at her local bead store, guild and area venues. 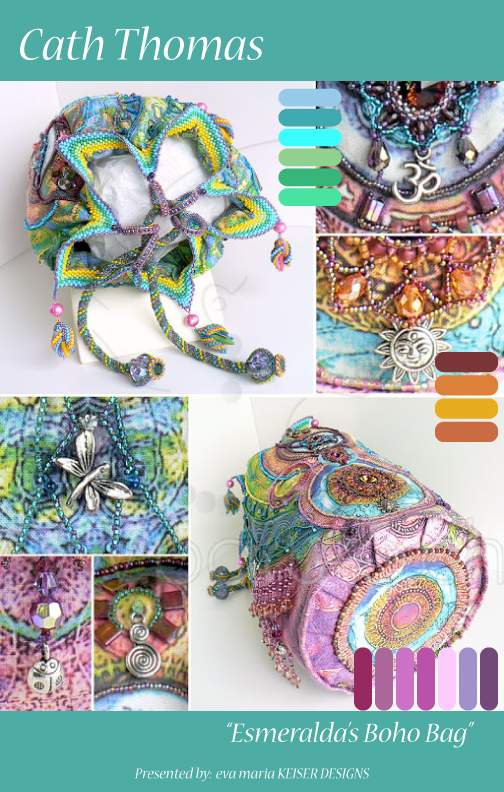 She is a published author and designer, and her work has also graced the cover of Beadwork magazine.